We’d love your help. Let us know what’s wrong with this preview of Children With Starving Brains by Jaquelyn McCandless. In the midst of a worldwide epidemic of autism, ADD, and ADHD, this book is a message of hope to parents embarking on the challenging journey of finding proper medical care for their Autism Spectrum Disorder children. 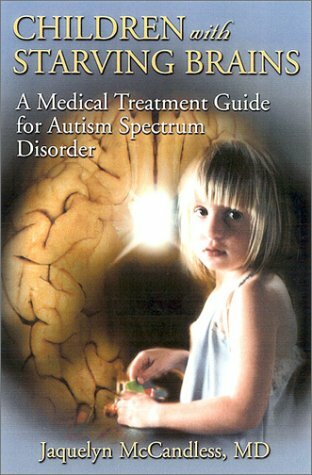 Genetic susceptibility activated by "triggers" such as pesticides and heavy metals in vaccines can lead to immune system impairment, gut dysfunction, and pat In the midst of a worldwide epidemic of autism, ADD, and ADHD, this book is a message of hope to parents embarking on the challenging journey of finding proper medical care for their Autism Spectrum Disorder children. Genetic susceptibility activated by "triggers" such as pesticides and heavy metals in vaccines can lead to immune system impairment, gut dysfunction, and pathogen invasion such as yeast and viruses in many children. This is the first book written by an experienced clinician that gives a step-by-step treatment guide for parents and doctors based on the understanding that ASD is a complex biomedical illness resulting in significant brain malnutrition. Dr. McCandless, whose grandchild with autism has inspired her "broad spectrum approach," describes important diagnostic tools needed to select appropriate treatment programs. Her book explains major therapies newly available and identifies safe and effective options for parents and physicians working together to improve the health of these special children. Author Biography: Jacquelyn McCandless received her M.D. from the University of Illinois College of Medicine and is certified as a Diplomate of the American Board of Psychiatry and Neurology. Since the early 1990s, her interest in women's issues and sexuality has led to an alternative medicine practice with a focus on anti-aging, brain nutrition, and natural hormone therapy. In 1996, after her granddaughter was diagnosed with autism, she returned even more to basic medicine and began working with biomedical aspects of developmentally delayed children. She now utilizes the knowledge she gained searching for treatments for her grandchild to help other ASD children. To ask other readers questions about Children With Starving Brains, please sign up. I have the THIRD edition. I am on chapter one, "Causation Models." Yay. This book laid out all the possible biomedical causes and I have the THIRD edition. I am on chapter one, "Causation Models." Yay. This book laid out all the possible biomedical causes and treatments in a very even handed manner. To the point that I am seriously considering taking Andy to a doctor that deals with holistic health and alternative therapies. If there was something you could do to improve the quality of life of your child with ASD that was not proven with extensive medical research but that was very low risk for any adverse side effects - would you take the chance and do it? Maybe nothing would happen, maybe only small changes...but if you never try anything you will never know. This book is an excellent guide for understanding the complex medical issues behind ASD's. The Biomedical approach to healing ASD's contains many, many thera If there was something you could do to improve the quality of life of your child with ASD that was not proven with extensive medical research but that was very low risk for any adverse side effects - would you take the chance and do it? Maybe nothing would happen, maybe only small changes...but if you never try anything you will never know. This book is an excellent guide for understanding the complex medical issues behind ASD's. The Biomedical approach to healing ASD's contains many, many therapeutic approaches and can seem like a jungle, this book does a good job of making a pathway through that jungle. Each child has a different set of challenges and therefore requires different biomedical treatments. There is no one cure-all solution but if you spend the time checking out your childs individual body chemistry issues and working out patterns then you can tailor the treatments to suit their individual needs and stand a much better chance of seeing improvements. Newer books cover the subject in greater detail and clarity. The 'Latest Development' section contains few new treatments, that was new to me. Overall a great book on biomedical intervention for autism. Informative, an eye-opener for parents. Yet, you still have to be critical that not all situations are applicable to your (child's) specific conditions. You are what you eat, and autistic children have extreme nutrition deficits. This is a fabulous reference book. A comprehensive overview of alternative treatments and therapies for autistic children, including the reasoning behind it, the evidence for it, and the potential for success.